The EQ2 macro system is pretty basic (intentionally so, no fully automated play here like in SWG) but is still very usefull. It is NOT possible to run another macro from within a macro. 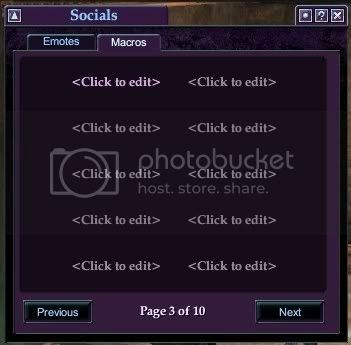 To make a macro, go to the menu and choose socials. From here choosethe macro tab. 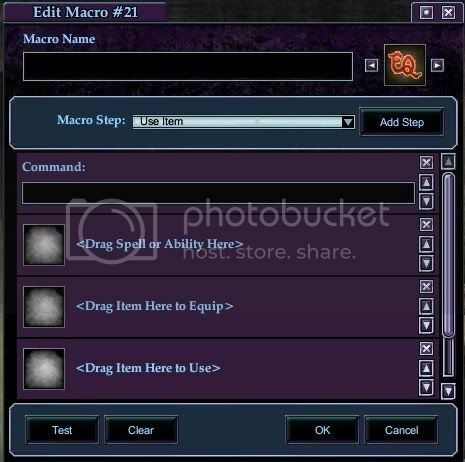 click where it says to create a new macro. Give your macro a name in the box provided. Choose an icon for your name. You can choose using the scroll buttons to either side or drag any spell icon from your knowledge book or any item from you inventory (more on using spell icons/items later). here you can enter any ‘/’ command, such as /group Incoming!! (which will say ‘incoming! !’ in group chat) or /camp desktop (which will camp you to desktop funnily enough). To use this step drag a spell or ability from your knowledge book directly into the box. You can only use two spells, abilities or items in any macro. If you try to use more than two, the first will be cast/used right away and the last qued up. If you are using a macro to cast a spell or use an ability, use the icon of the first spell/ability you are using as the main macro icon. this way , the macro icon, when dragged to a hotkey, will dull/brighten when unavailable/available. Drag any item you wish to equip into the box from your inventory. If you drag an item from an equipped slot, this will not work. You can equip many items in a single macro, but if incombat you wil be unable to change equipment (except for your main and off-hand weapon. edit.. It is now possible to macro items to be equipped in your appearance slot. if you wish to place an item in appearance, follow the procedure here, but check the ‘appearance’ box. To use an item (such as manastone, totem etc…) from a macro you must drag th eitem into the box given. If the item needs to be equipped to be used, you must drag it from an equipped slot, not your bags. using items follows the same queing rules as spells, i.e you can only use two in any macro. 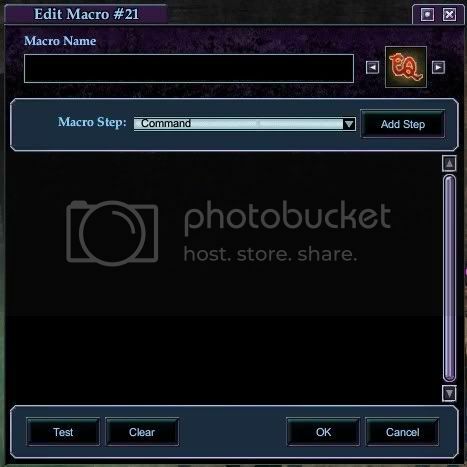 Once you have all of your commands in the macro, you can click the test button to try it out. If you wish to change the order of any of the steps, just use the up and down arrows to the right hand of the step to adjust the order. Once you are ready click OK to save the macro. not all symbols will work, trial and error will show you which ones do.